Reuniting with Mr. Liao in Wuyi Mountain, China, for our sixth year in business partnership together, feels like coming home. As Silver Needle Tea Co’s first tea estate, they hold a special place in our history. Mr. Liao shares a tasting of their newest harvest. Many of our bestsellers, Big Red Robe, Wuyi Mountain Black Tea and Golden Beautiful Eyebrow, come from Wuyi Mountain. The rows of tea bushes right below this mountain are transformed into our Golden Beautiful Eyebrow. This close-up belies the intense 7000 ft. elevation - more than an hour drive upwards. As the elevation rises, so does the air quality and soil make-up. With a sub-tropical climate, Wuyi Mountain offers the most ideal growing place. While teas do survive in a broad range of conditions, the best quality tea leaves thrive in subtropical climates with some seasonality, like Wuyi Mountain and our other estates in Taiwan. Loving every intoxicating inhalation of tea leaves on Wuyi Mountain! Most of our teas from Wuyi Mountain are hidden between mountains, shaded by trees. This ensures protection, so the leaves retain vital moisture. After an hour drive and 30-minute walk across several ancient wooden panel bridges, we reach these magical seas of tea. Hiking my way up the mountains was quite challenging, and I kept remembering the strength of the tea pluckers, walking out here with their tools and baskets. How lucky to be surrounded by a pristine natural environment where every breath is filled with the scent of fresh tea leaves! From inception, my mission for Silver Needle Tea Co. is to share my favorite teas from Asia, the origin of Camellia sinensis, and highlight the land, terroir, and people that nourish them. I hope you glimpse a sense of place and wonder at the elements at work that cultivate some of the best teas in the world, from the rolling hills and pristine waters to multi-generational family farms at elevations so high you feel like you could almost touch the sky. These annual pilgrimages encourage vital remembrance and reconnection with our tea partners and the sacred natural forces and alchemy we honor with every sip. View of our Pingling tea estate in Taiwan. Here’s an intimate view of the verdant tea gardens from the owner’s home. The pure air, water, and rich soil infuse earthy elements into our High Mountain Oolong. After a mountainous two-hour drive from Taipei, we arrive at our newest tea estate for High Mountain Oolong in Ping Ling, Taiwan. The tea bushes flourish along the Gaoping River, a major source of drinking water for the city due to its purity. In the photo, the tea bushes sit on the terraced hill on the left while across the river to the right, the estate owner lives in the farm house with the orange tinted roof. Over 80% of residents are tea growers or involved in the tea business. Meet the tea estate owner, Mrs. Gao. As a fourth generation tea farmer, she is a tea expert, connecting through land and family knowledge. With six daughters, she’s continuing the tradition, rarely short of help on the farm. She happily notes that now that they’re all married, each with two children, they rotate to pitch in with her 18 laborers throughout the year. Everyone comes together during harvest season. Here’s our newest tea, award-winning Oolong, Oriental Beauty, from Sanxia District in New Taipei. The International Taste & Quality Institute (iTQi) in Brussels, the world's leading independent Chefs and Sommeliers based organization dedicated to certifying the taste of food and drink products, presented this distinction. Looking out at our Sanxia tea estate, you may notice that these bushes look different. The bushes are spaced with more distance from each other to allow farmers to move between them and hand pick. This estate does not use tea picking machines. Tea machinese were invented in the 1950’s and by the 1970’s, most tea farms utilized them in some capacity to cut costs and expedite the harvest. However, the highest quality tea leaves must be hand picked to ensure the top three leaves are intact. Mr. Lee works in the tea house, a few steps from the processing center. He’s the face of the company, communicating with vendors, while his brother is the tea master, overseeing the processing center, monitoring the production, and ensuring every batch is made to the highest standard. Mr. Lee’s tea pluckers head to the mountains. Their days often begin early and conclude by noon because the leaves moist with morning dew ensure the best state for production of unmatchable flavor. According to legend, the Iron Goddess of Mercy appeared in a poor farmer’s dream in this temple, leading him to discover the tea and his prosperity. I had the pleasure of meeting Mr. Lee and his family. The shelves in the background showcase the numerous accolades he receives year after year for the award-winning Iron Goddess of Mercy, Tie Guan Yin, that he produces for us. Mr. Lee's parents are beyond welcoming and kind. I love the architecture of their home which incorporates design elements from the famous temple in town. Many houses in Anxi mirror this distinctive style. While tea tasting, before I could inquire about restaurant recommendations, Mr. Lee revealed that his parents had just prepared homemade noodles for our lunch. Delicious. "They are family", says Mr. Lee, referring to tea masters who have worked for his estate for decades. Mr. Jiang, long time business partner, describes how they transform these exceptional leaves into the esteemed Iron Goddess of Mercy. A closer look at the verdant leaves that become our Iron Goddess of Mercy, Tie Guan Yin, now available online. These inspiring trips reconnect us to the source, feeding our passion for pure tea and desire to share the very best with you. After almost two hours up the mountain, we arrive at the estate of our new High Mountain Black Tea, in LiShan, Taiwan. The quality of every tea begins with terroir, topography, soil composition, climate, and perhaps most of all, elevation. The purity of the air at 9000 ft makes this tea truly extraordinary. This batch of leaves is fresh off the mountain and in the first stage of processing. Darker teas in the Oolong and Black categories require around 10 cycles of withering, rolling, and oxidation to achieve their specific taste profiles. 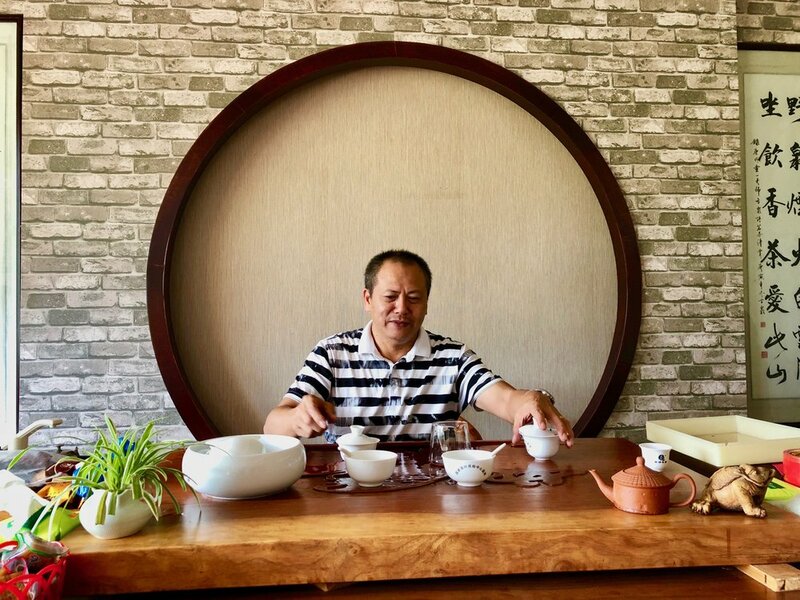 Meet Mr. Lin, a fourth generation tea master and owner of our tea estate for High Mountain Black Tea. Over multiple tastings of freshly made tea from the production center next door, Mr. Lin describes his childhood dream of becoming a tea master like his grandfather. Not only did he realize this dream, he also owns multiple tea estates throughout LiShan. Mr. Lin's teas are exclusively sold in high-end restaurants and renowned tea shops in Taiwan. We are the only tea store outside of Taiwan offering his tea. Multiple tea masters are on-site 24 hours a day to monitor production and quality. Every batch requires tasting and approval by every tea master on the floor before being packed. Whole leaf teas after the first rounds of production involve many more rotations of withering, rolling, and oxidation before becoming the High Mountain Black Tea we bring back to the U.S.
After whole leaf production, crushed remnants will be made into tea bags. Back to Taipei for the famous tea braised fish from Wisteria Tea House, one of the oldest tea houses in Taiwan. Rolling slopes, lush green, and enveloping mist, LiShan is a dream. Our exclusive High Mountain Black Tea is now available. Silver Needle Tea Co. was first imagined here in Wuyi Mountain, China. The splendor inspired my vision and lifelong journey with tea. No matter how many times I return, I'm constantly in awe of the beauty. The grandeur of the mountains is uplifting and energizing. And every time I leave, I dream of new ways to share the experience with more people. These lush green leaves produce our Big Red Robe (Da Hong Pao), Golden Beautiful Eyebrow (Jin Jun Mei), and Wuyi Mountain Black Tea. The morning sun beams down as I pluck tea leaves with the owner of the tea estate. Harvest season, typically in April and May, coincides with our visit. Hard-working collectors gather leaves by hand, all day long. Leaves are picked depending on location, and the entire mountain is harvested in a month's time. Reaping in spring produces more rich and condensed leaves with specific taste profiles. These white spots reveal age, indicating that this tea bush is about 40 years old. Five kilograms of green leaves will produce one kilogram of leaves for tea. After withering or air drying, the leaves are rolled and bruised in a machine. Holes in the bottom release impurities. Then the leaves are oxidized in an oven-like machine and left out to dry. Depending on the tea type and desired taste profile, the tea master will repeat the process with the same leaves many times over a period of months. At long last, tasting from the recent harvest. With a deeper understanding of how much work creates each tea, I appreciate every drop. Enjoy our newest tea from Wuyi Mountain: Big Red Robe (Da Hong Pao), Wuyi Mountain Black Tea, and Golden Beautiful Eyebrow (Jin Jun Mei). Every year, we visit our tea estates to reconnect with partners and learn more about the earth's most precious leaves. Inevitably, our love and admiration deepens. The first stop is one of the most beautiful places on earth: Wuyi Mountain, China. Breathtaking views from the top of this hill reveal the origin of Silver Needle Tea Co.'s Golden Beautiful Eyebrow, Big Red Robe and Wuyi Black Tea. The elevation is above 4000 ft., and the air is pristine. Meet Mr. and Mrs. Liao, our tea estate owners in Wuyi Mountain. Born and raised here, Mr. Liao is a fifth generation tea master. Pictured above, he passionately describes the unique, nutrient-rich soil of the region from which some of the most expensive and coveted teas in the world are rooted and emerge. Here's an up close shot of the tea leaves. Some of the rarest teas like our Golden Beautiful Eyebrow use only the top bud of each branch. Other teas consist of the bud and two leaves below. The third and fourth leaves are often avoided, as they offer less potency and can jeopardize the taste profile. Mrs. Liao took this photo of me. I couldn't resist trying to capture the incredible landscape! The next morning we had breakfast at a popular neighborhood eatery that made delicious Vietnamese noodles. We trekked out to an alcove for tea, though you do have to bring you own. According to Mr. and Mrs. Liao, only locals know about this secluded place. The hike is pretty far but one glimpse of the idyllic setting, and you'll linger for hours. This was one of my favorite tea spots. Back to the tea estate. Different teas arise from distinct cultivars, plant varieties, developed by tea masters to create a certain taste profile. There are about seven cultivars of tea in the surrounding hills. While difficult to distinguish at first, I began to slowly discern subtle variations in the leaves after a couple of days. In this photo, Mrs. Liao reveals some of the most expensive tea leaves on the estate. Shielded from the sun by bamboo trees, the leaves are more tender and flavorful. Before visiting the current production center, Mr. and Mrs. Liao invited me to see a former location where family both lived and worked for several generations. The home is filled with antique tools and ancient artifacts, like the tea baskets pictured above, that are hundreds of years old. Today, tea production centers and living quarters must be separated. This is the production center now, which houses four machines for roasting and other machines for firing and rolling the leaves. The modest facility is a considerably small-scale operation. They harvest once a year, producing only three tons of tea annually. The tea is so high in demand, we order months in advance to secure our small batches to bring back to the U.S.
Time for tea tasting! Here are four grades of Golden Beautiful Eyebrow. The price variation between the highest and lowest grade is so dramatic, you can even taste it in the flavor profile. Tasting pure tea calls for multiple infusions to experience how the teas evolve. Some can be re-steeped more than ten times. The flavors and aroma continue to develop, a signature trait of exquisite tea. We love partnering with tea masters like Mr. and Mrs. Liao, who intimately understand, cherish and honor pure tea. Building relationships with our producers develops knowledge and vital insight into the teas we procure. Golden Beautiful Eyebrow, Big Red Robe and Wuyi Mountain Black Tea are now available in our Summer Tea Collection.